The silkscreen has been improved: The lines are now showing the contour of connected pads instead of following the tracks. The power supply interface has also been improved: the capacitors are after the diodes (or resistors). Read my blog for more informations, more pictures. A stripboard dedicated to Eurorack module format. 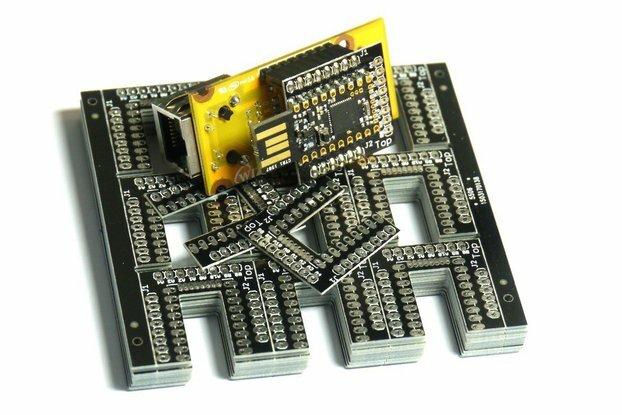 The most convenient way to build any simple module. Just use it as a standard stripboard PCB. 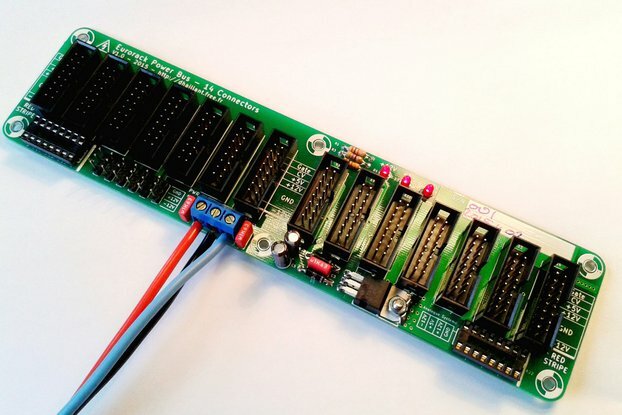 This stripboard is designed to help in the process of building your own module. Power supply interface is almost completed: 16 pins connector with silkcreened signal marks, filtering capacitors and bead filters or protection diodes. You can use up to 5 potentiometers or 5 Cliff style Jack connectors. 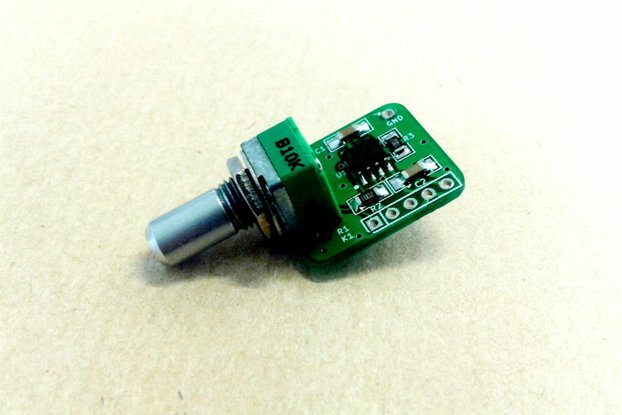 Potentiometers can be any of 9 or 16 mm types, Alpha PKN160 for example. This is PCB only, no component provided. Use any component you need :) Be creative! 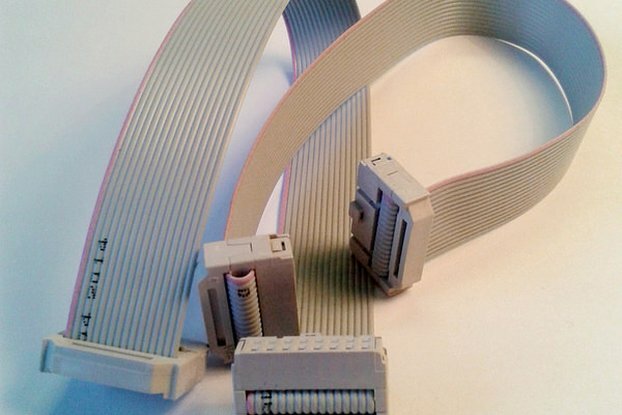 It's a good alternative to standard stripboards: it's easier to add potentiometers and jack connectors, easier to implement the power supply interface. And it's already cut to Eurorack dimensions. The PCB is made in industry quality standard 1.2 mm thick, FR4 material. Plated through holes and green solder mask for easy soldering session. All the projects I sell are designed for myself. Then, I sell surplus products. I made this stripboard to fit my needs. I'm sure it fits your needs too! 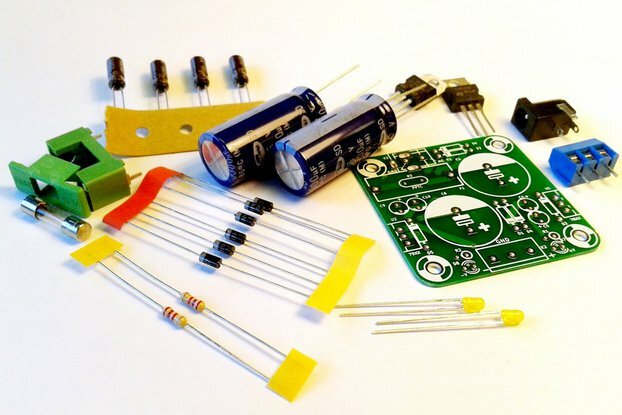 If you're not satisfied with one of my kit or PCB, you can send it back and I will refund you, as long as the PCB or the components has no damage from a begin of assembly: no solder, no cut or bent leg, etc. Before returning a product, you must contact me first. Standard Priority Mail by La Poste, for letter format package, up to 100g, without tracking code. Colissimo International by La Poste, for parcel format package, up to 500g, with tracking code. 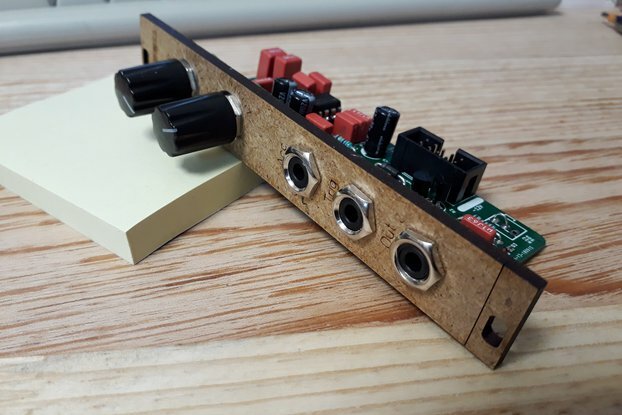 This Eurorack proto-board is perfectly sized for quick module builds and development. I have hand-built almost all of my modules (except for one -- couldn't live without a DSI Curtis Filter...) and this PCB is by far the quickest and most straightforward platform for building modules that I've encountered, the design is very good, with three rails accessible for op amps / etc, places for power-protection diodes and a keyed header, and the mounting holes are well positioned and well sized. Shipping (I am in US) was quick and package arrived in good shape. I use #6-32 screws for my builds and have to widen the holes slightly but there is more than adequate room around them with no copper so you can do this. 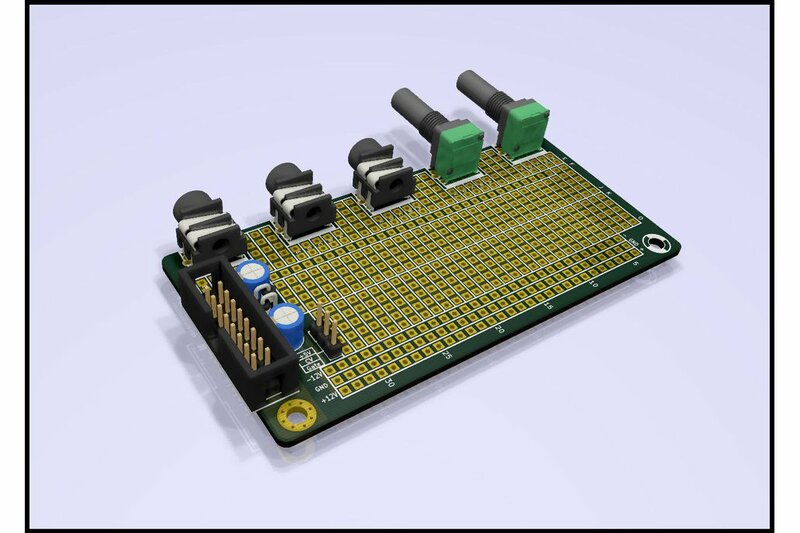 The layout is essentially similar to standard "breadboards" which makes transferring a breadboarded circuit to PCB very easy. 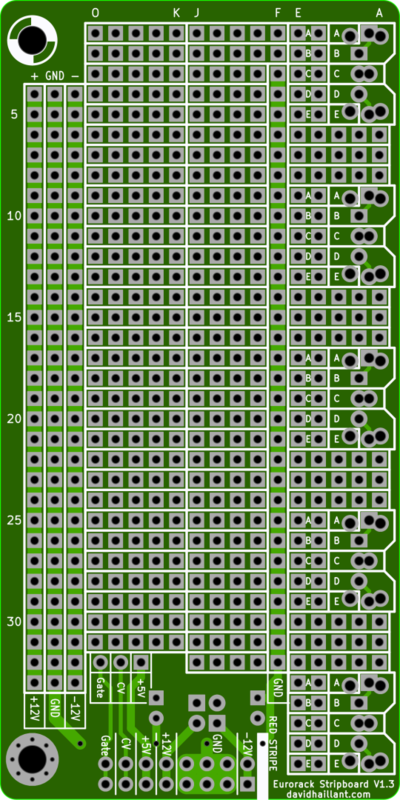 This is a far better and more useful layout than even the classic Adafruit perma-proto boards. What else is great? If you use through-hole pots, jacks etc this is absolutely PERFECT and you can create very slim builds. You can easily access and use the 5V power rail if that's your preference, and although there isn't a separate power bus for this I have not found it inconvenient. I honestly plan to use these PCBs for any/all my future builds, even ones of higher complexity can simply utilize them stacked or side by side. 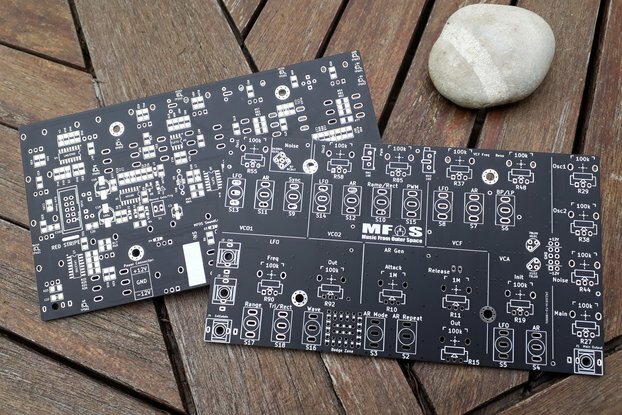 The Eurorack Stripboard PCB is great for trying out prototypes and one-offs. Easy to use and fits nice behind a panel. Using one for a mixer expansion for the JH Living VCO and one for a simple LFO. Would love it if there could be 5 connection points on both sides of the center while still keeping the ground connection on both sides. Since many op-amp circuits need a feedback resistor, bypass cap and an output connection is gets a little cramped on the side with only 4 connection points. That is the only thing that I would change. However it is still very useful and flexible as it is. Love it. Thank you Dale! I'm glad you find it useful. I'll see how I can improve the number of connection points in a future version. 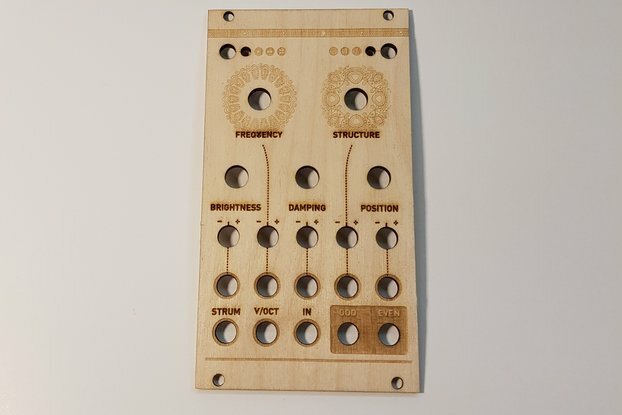 Very versatile and useful for building eurorack modules. 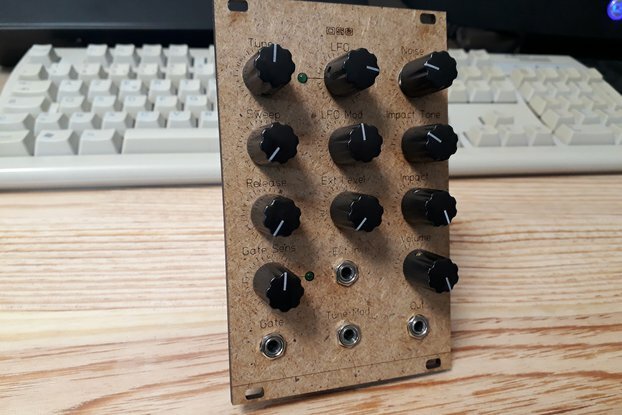 Using it for building eurorack/frakrak style Arduino-based synth modules. Lends itself nicely to mounting 9mm or other size pots and 3.5 mm jacks along the edge so the boards mount easily to a panel. 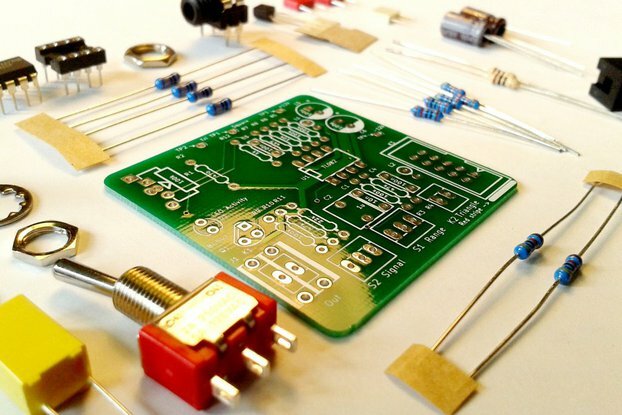 The prototyping area is excellent for using the smaller breadboard-friendly Arduino Mini/Micro/Nano and Teensy boards for creating flexible and programmable synthesizer modules. Originally bought two with no immediate usage in mind, then decided to try using them for the current purpose. Worked so well and liked it so much I bought half a dozen more. And will probably get more when those are all used. Highly recommended.